John Edward Forster was born in 1892 to John Jennings and Mary Jane Forest. He had three brothers and three sisters and at the time of the 1911 census, when he was aged around 19, the family lived at Bolts Run, Rookhope. He worked as a horse driver at the local lead mines where his father and some of his siblings were also working. At the beginning of the war John enlisted at Rookhope, and joined the 18th Battalion of the Durham Light Infantry (DLI) which was based at Cocken Hall, north-east of Durham City. The 18 DLI was referred to as the Durham Pals due to the method of recruitment it used; it was common for soldiers to enlist with their friends and colleagues. Here he would have undergone training which lasted several months, during this time some men of the 18 DLI; possibly including John, saw action when the German navy raided the north-eastern coast line, the 18 DLI managed the defenses receiving 16 casualties. 18 DLI completed their training by late 1915 and were eager to get back at the Germans for their coastal raids, however they would have to wait as the Ottoman Turks attacks on Egypt were threatening the British supply routes through the Suez canal and so 18 DLI were deployed there to combat them. The Battalion traveled to Liverpool where they boarded the ocean liner ‘Empress of Britain’, sailing out of Liverpool on the 7 December 1915. The voyage was described as overcrowded, had poor quality food, and took longer than usual owing to the cautious approach taken to avoid submarines. The ship arrived at the port of Alexandria on the night of 19 December. Then 18 DLI was moved to Hill 108, and were ordered to dig trenches in the sand, and defend the defensive line against possible enemy offensive action. However this action did not materialize, and 18 DLI were moved to the western front. Despite limited service in 1915, John was still eligible for the 1915 Star and was thus awarded it. Arriving at Marseilles on March 11th 1916 John would have fought at the Somme. On 1 July, D company took heavy loses when German artillery fired into the packed trench lines. By 5 July the Battalion had casualty rates close to 60% of its forces. John survived this onslaught and the Battalion continued to serve as a rotational relief force at the Somme. In April of 1917 the Battle of Arras got underway, it was an attempt by British Forces to break the German defensive line and force them to retreat. It was here that John was killed. 18 DLI planed for a night attack on 17 May, at the enemy held Gavrelle trench line. The attack failed when the Battalion was outflanked and raked by machine-gun fire. For his service he was awarded the British War Medal and Victory medal. In addition to the previously mentioned 1914-1915 Star Campaign medal. 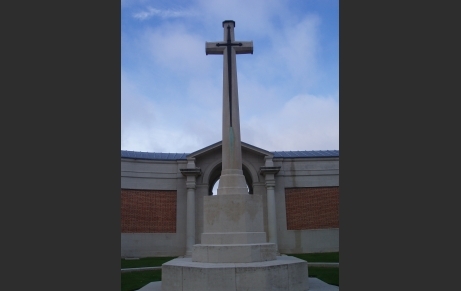 He is remembered for his sacrifice, and memorialized at the Arras memorial which is located in the Faubourg-d’Amiens Cemetery, locared in the western past of the city of Arras.